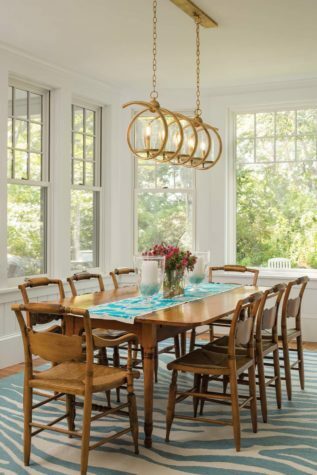 Hurlbutt Designs captured the colors of the sea and sand in the front entry hall, with a tumbled seaglass chandelier from Currey and Company and Thibaut’s Bankun Raffia wallpaper. 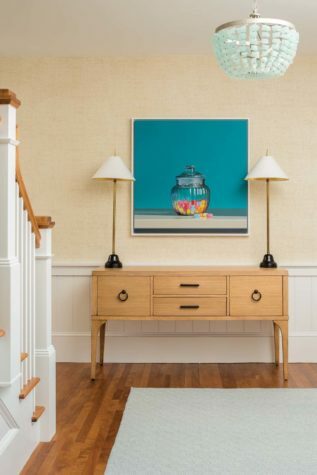 Still Life Jelly Beans, by English artist Christopher Green, is displayed above a console from Barclay Butera’s Newport collection for Lexington. 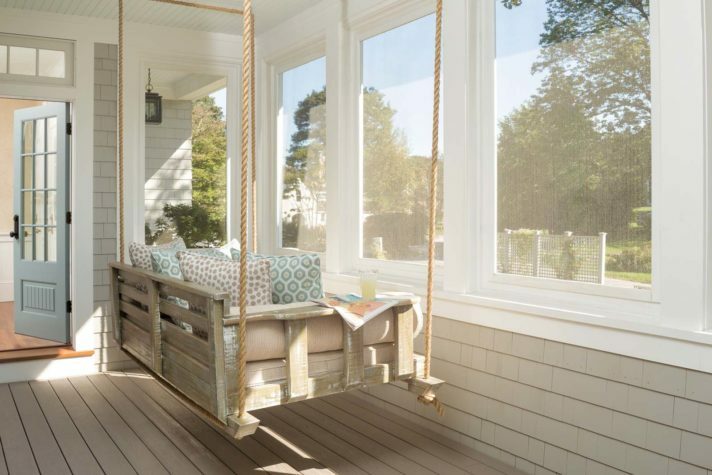 A three-season porch provides a place to catch the sun, the views—and maybe even a nap. The screens swap out for storm windows come fall. The gambrel-roof beauty sits high up on its lot, elevated from the street. Landscape designer Ted Carter built up the property’s steep slope, a time-honored trick designed to redirect eyes from the public street along the perimeter below to the landscape beyond. Memory and modernity meet in the dining room, where Currey and Company’s gilded wrought-iron chandelier illuminates the maple dining table and the Hitchcock-style chairs (part of a set of 16) that have served the family faithfully for decades. The more spacious kitchen, designed in collaboration with Sylco Cabinetry, now offers a place for everything and everyone. 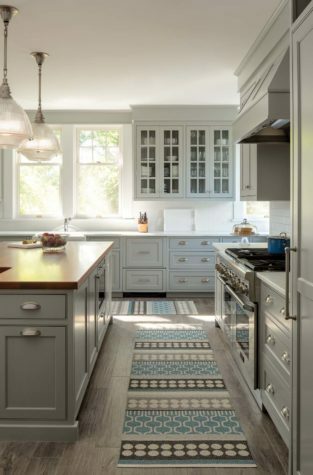 Cabinetry and cornice trim are painted in Benjamin Moore’s calming “Coventry Gray.” Floors are faux-bois porcelain “planks” from Distinctive Tile and Design. In a third-floor bathroom, marble and black granite basket-weave floor tiles underscore the subtle line-and- dot pattern of the navigation-chart-inspired wall covering by Ralph Lauren Home. Vintage rattan chairs (freshly painted aqua) and woven seagrass seating from Palecek furnish a sunroom arranged to facilitate conversation, relaxation, and fun. 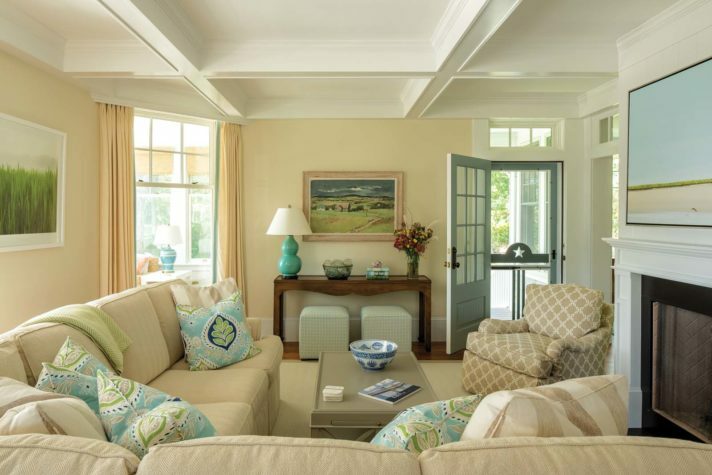 In the serene living room, contemporary artwork pays tribute to the coastal landscape, while the Lone Star motif of a custom screen door from Maine’s Wooden Screen Door Company salutes the family’s Texas roots. 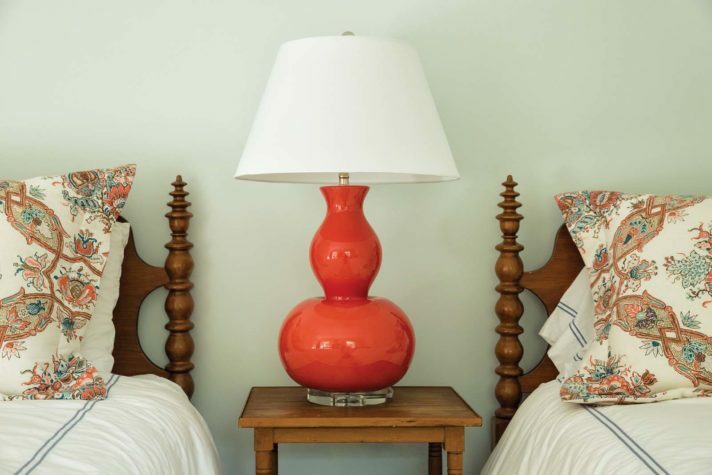 Walls painted in Benjamin Moore’s “Natural Wicker” serve as a backdrop for the exuberant curves of the guest bedroom’s vintage turned-wood bedposts and acrylic-base ceramic table lamp from The Natural Light. The third-floor bunk room’s awning windows crank out for ventilation. The slatted twin beds were crafted by Maine Woodworks. 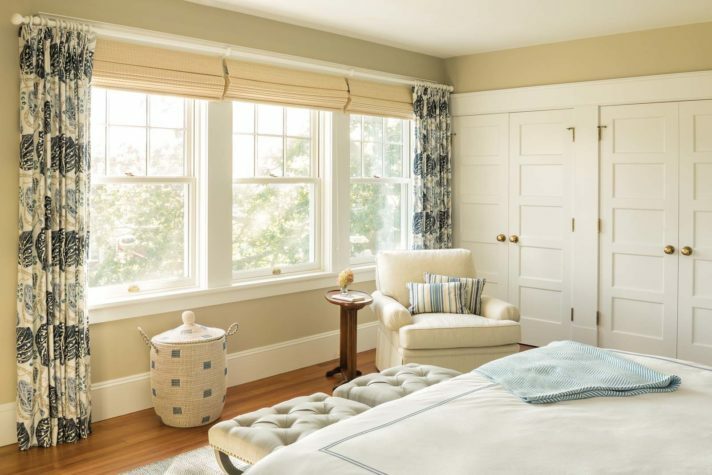 In the owners’ bedroom, new five-panel doors replicate the home’s originals, which were no longer functional after years of shaving down to accommodate the second story’s former sixinch slope. Every bedroom has a lidded seagrass storage/laundry basket from Serena and Lily. The curtain fabric is William Yeoward for Designers Guild. A new staircase leads into the living/sleeping space of the multitasking third floor, which is sheathed in nickel-gap boards painted in Benjamin Moore’s “Decorator’s White” satin. 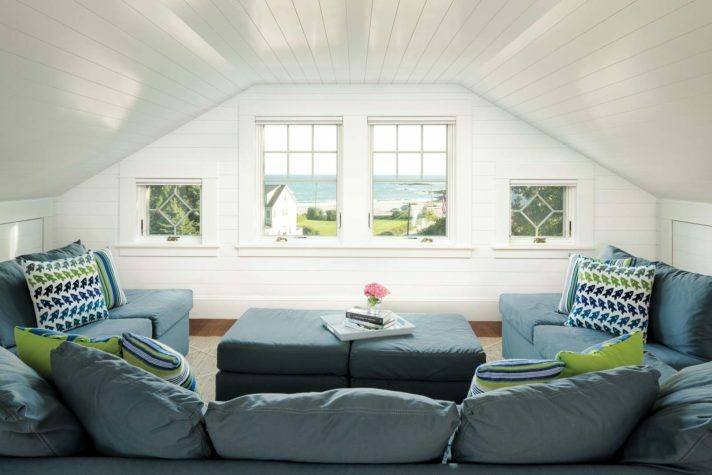 In the third-floor seating area, a pair of Andersen casements fashioned to look like traditional double-hung windows frames the ocean view. 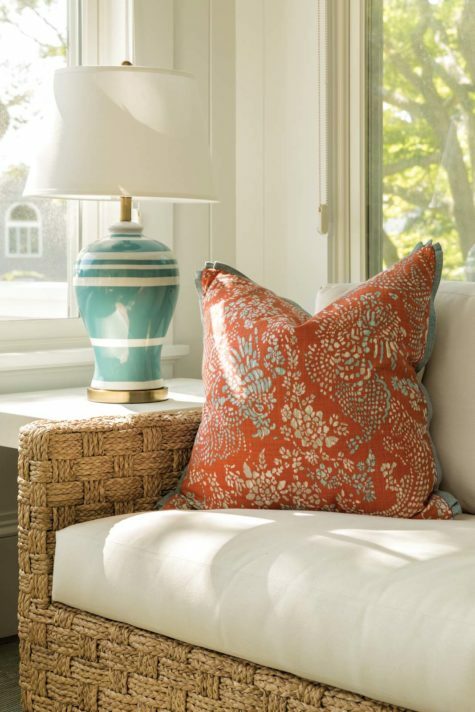 Hurlbutt Designs brought the fresh greens and blues of the summer landscape indoors via the custom pillows that brighten up the 10-year-old Mitchell Gold + Bob Williams sectional, still as comfortable as ever. 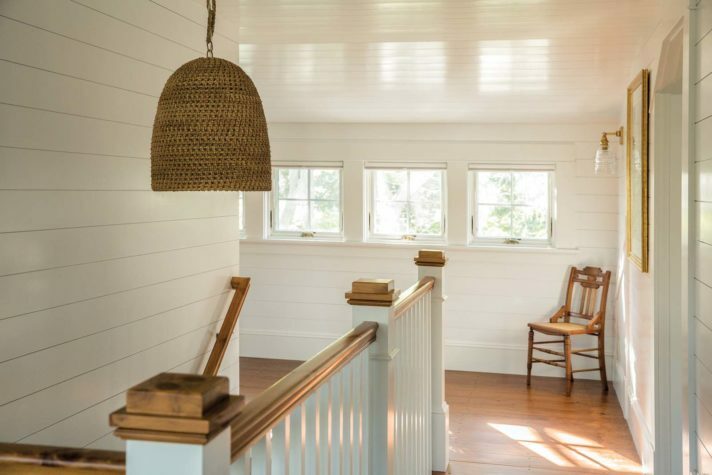 Like many home renovation stories, the tale of this classic Maine cottage is part practical design and part romance, with a little bit of horror and a very happy ending. As any homeowner who has ever seriously explored the question “Can this old house be saved?” knows, you’ve really got to love a place to invest in the kind of meticulous revitalization project the owners of this multigenerational family retreat pulled off in York County. They share much of the credit for their success with their expert design and construction team, led by interior designer Louise Hurlbutt of Hurlbutt Designs, architects Rob Freedman and Mike Bedell of Kennebunk River Architects, landscape designer Ted Carter of Ted Carter Inspired Landscapes, and a stellar crew of craftspeople and contracting professionals directed by Spang Builders. From the start, the clients made it clear to their design team that any and all changes made to the property needed to embrace the home’s original materials and spirit. “It was important to us that when people walked into the house after the renovation, they would feel like they were still in the same house,” says the husband. Space-planning discussions started in earnest in May 2016. Construction began in mid-September and continued through a rough New England winter, with the understanding that the project would be complete and ready to be enjoyed by extended family and friends again by the following Fourth of July—a challenge the team took pride in accomplishing successfully. 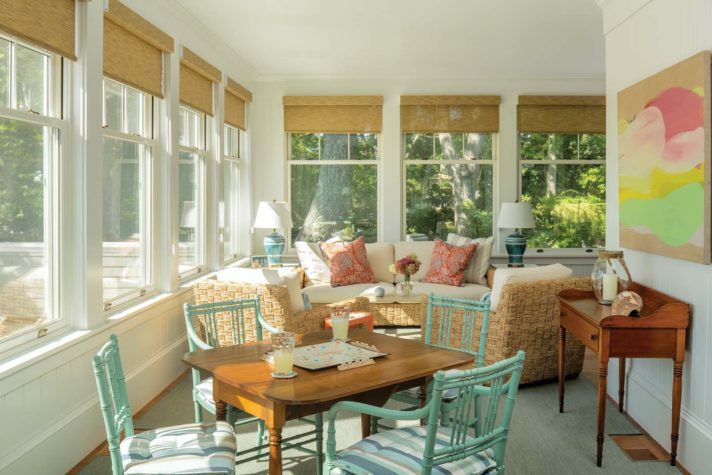 Working in collaboration with the homeowners, Hurlbutt and Kennebunk River Architects conceptualized a space plan that opened up the kitchen to the dining area and exposed the busiest room in the house to the best views via well-proportioned and well-insulated Andersen windows. The HVAC system was given an overhaul, and new insulation was added to winterize the house more effectively than the Titanic-era newspapers found rolled up between the second story’s studs. Outdoors, Ted Carter’s changes to the landscape—which include the design and installation of a bluestone front walk, architectural screening, a structurally reinforced grassy area in lieu of nonpermeable asphalt for overflow parking, and graceful borders planted with ornamental grasses, cottagey shrubs, and supple perennials—recapture lost views, create a sense of arrival, and erase the public domain from view. 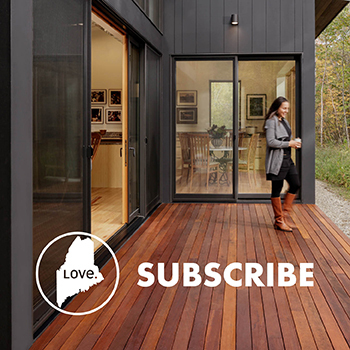 “Ted’s work gave us more privacy while reestablishing the house’s connection to the landscape that surrounds it—the whole reason we’re here,” the client explains. Throughout the construction phase of the project, Hurlbutt, Freedman, and Bedell partnered closely with the construction team from Spang Builders, led by senior project manager Norm Laliberte, to achieve the clients’ goals in numerous ways, large and small. First, they honored the wife’s wishes to preserve the original fir and red birch flooring on both first and second floors, ensuring that the wood everyone in the family had walked on for generations would remain a part of the heart and soul of the house. Second, they kept the flow of the first-floor dining room, kitchen, and living room true to the original floor plan. Instead of demolishing interior walls to make an open plan or great room, as in most modern interiors, the architects opened up the view by widening the narrow doorway that already existed between the original kitchen and the original dining room. Pocket doors installed between the rooms give the family the option of closing off the kitchen from view whenever they wish to create a more intimate environment in the dining room or isolate the activity and aromas of the highly efficient and always bustling new kitchen designed by Sylco Cabinetry. During the second-story demolition stage, things hit a glitch that brought the fast-track project to a sudden halt. (This is where the horror part of the story comes in, but don’t worry—there’s a whole cast of heroes who quickly make things better.) When the team from Spang Builders gutted the interior space to make way for the new upstairs bathrooms, they made the shocking discovery that, sometime in the middle of a twentieth-century renovation, metal tie rods had been installed to stabilize overstressed load-bearing walls—a solution that was no longer working effectively, evidenced by the fact that the walls now measured a full six inches out of square. “Basically, it became apparent that the house was slowly structurally failing,” explains Freedman. The revelation sent the entire design team back to the drawing board. “That’s when everything shifted gears,” says Bedell. 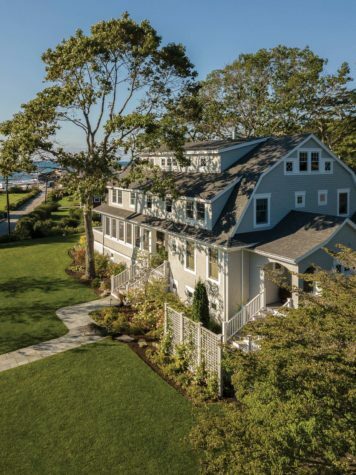 After consultation with an engineer, the clients made the tough-love call to take the structure down to the second-floor deck and rebuild the top two floors from scratch, while preserving the lines of the house’s distinctive gambrel roof. For Spang Builders and their construction team, this meant fastidiously tarping up the expansive rooftop worksite at the end of every day’s labor, to save the second story’s original fir floors from the winter weather that would have other- wise destroyed them. The good news is that the extreme efforts made to update, stabilize, and preserve the structure for the next century also made it possible to increase usable living space on the third floor, with the addition of shed dormers that echoed the existing ones on the second floor. 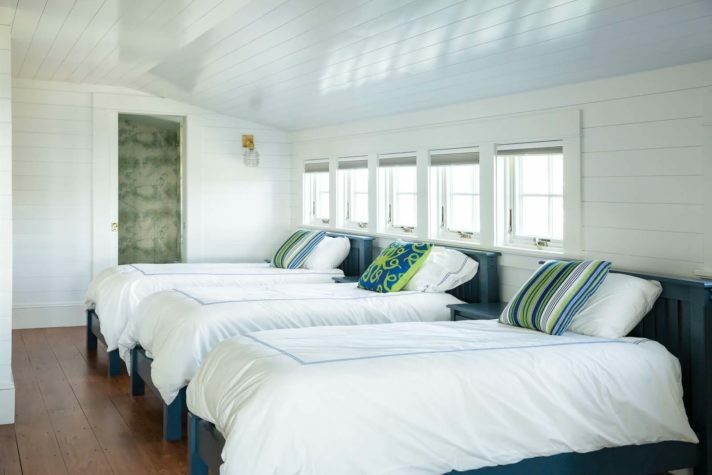 Formerly cramped attic space, the top floor now accommodates a comfortable guest bedroom and a triple bunkroom, two baths, and a cozy seating area with windows positioned to capture ocean views. The Big House is back—better functioning, more structurally sound, more comfortable, and more beautiful than ever before—and ready to serve the family for the long term. 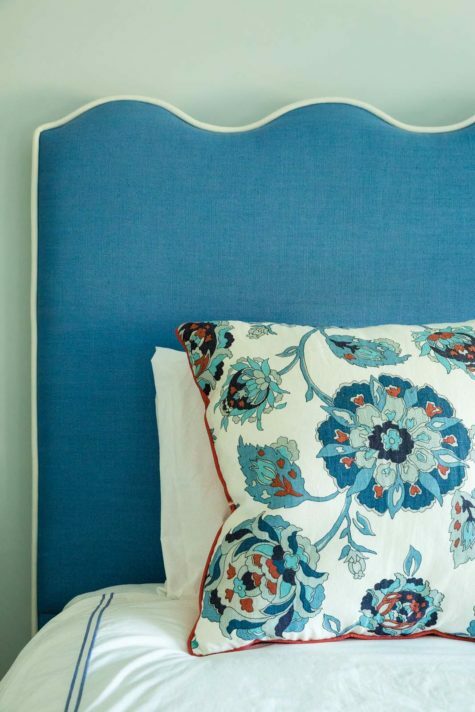 Carefully chosen lighting and textiles carry pops of coral and blue throughout. 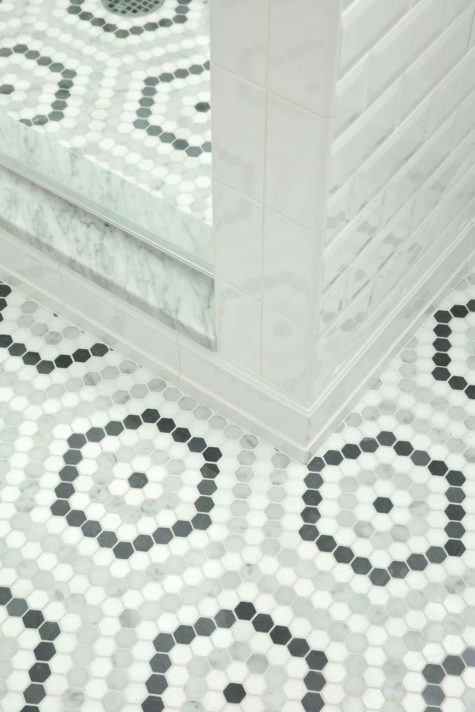 Penny-round bath tiles compose a hexagonal pattern inside and outside a shower stall of one bath. 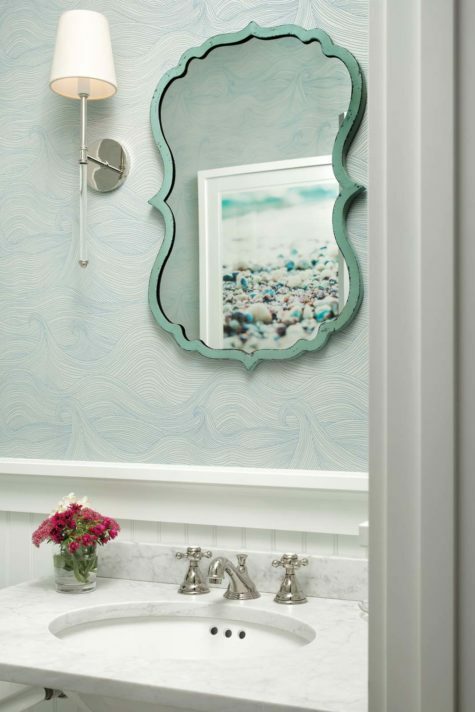 A shapely wall mirror reflects vintage charm in another.